Sheffield 70 3/4-Inch Double Vanity Cabinet in White Distinctive styling and elegant lines come together to form a complete range of modern classics in the Sheffield Bathroom Vanity collection. Inspired by well established American standards and crafted without compromise, these vanities are designed to complement any decor, from traditional to minimalist modern. Available in multiple sizes and finishes. 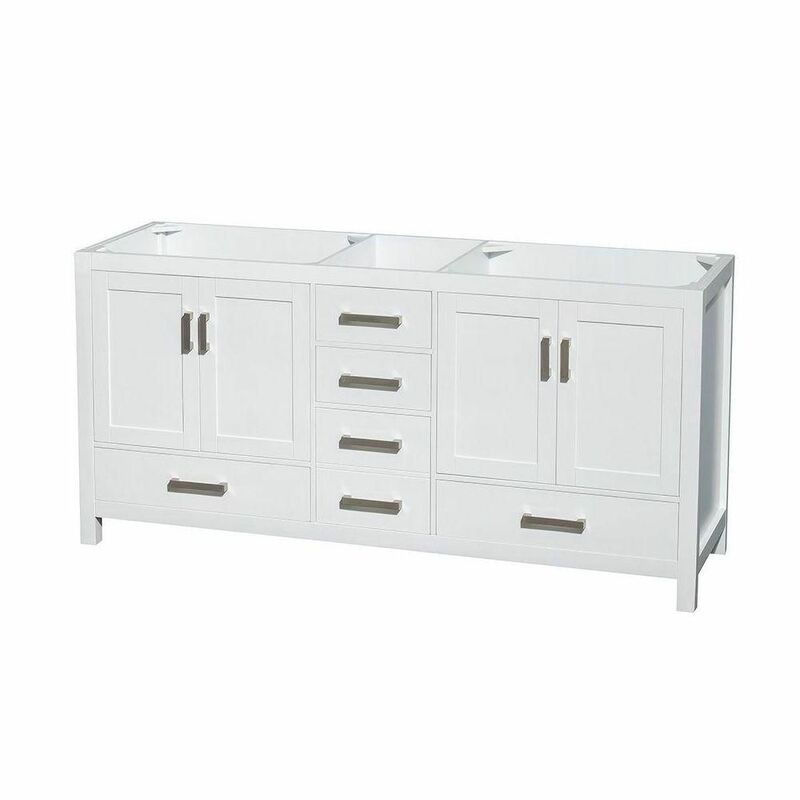 Sheffield 70 3/4-Inch Double Vanity Cabinet in White is rated 3.9 out of 5 by 7. Rated 5 out of 5 by 7BRANDI5 from Top notch quality! Top notch quality! Rated 5 out of 5 by LDA from Well made and solid finish.... Well made and solid finish. Rated 2 out of 5 by TI from Vanity seems well built but the attention to detail on the paint is questionable. Right out of th... Vanity seems well built but the attention to detail on the paint is questionable. Right out of the box from the factory you can see that the paint was badly touched up. You would think that they would have painted the whole side again instead of hacking the paint job. I wouldn't care so much but this is the side that faces you as you walk in. Rated 4 out of 5 by EAB from Good quality. Be aware, this vanity is super bright... Good quality. Be aware, this vanity is super bright white - almost a bluish-blackish white - snow white. Having to repaint molding with custom white because it doesn't match. Also, doors and drawers are flush mounted / inset vs overlay, not bad just different. Handles are cheap - replacing them. Rated 5 out of 5 by Amy from The vanity looks great and the quality seems very good.... The vanity looks great and the quality seems very good. However, BE AWARE: the vanity is very tall! I assumed there was a standard height but this is significantly taller than any other I have used. I am 5'2" and I can just barely use it comfortably. So I wouldn't recommend it for kids. Rated 5 out of 5 by HappyinWisconsin from Great quality for the price. Our contractors were very impressed too. Great quality for the price. Our contractors were very impressed too. Rated 1 out of 5 by Sarah800 from Paint Cracked! I was so disappointed in this vanity. It looks great in the picture and most reviews say the finish is supposed to be good. The vanity we received had unsightly cracks between all the wood joints on the front face. Sadly, it had to be returned.